Show people you have good taste in food and literature. Scarf or Barf Comes to Life! What's one thing you would have never guessed about me? If you've been listening to Starving for Attention, Richard's podcast, you've surely heard the game sometimes played called "Scarf of Barf". Essentially claiming your love or complete distaste for a certain ingredient, dish or cuisine. Well, the lovely Pickler & Ben decided to play this game live and make Richard "eat his words". Check it out! Hey! Do you like blooper reels? Well, then you'll love this clip from a recent event I did in Syracuse, NY with WNYC. Enjoy! 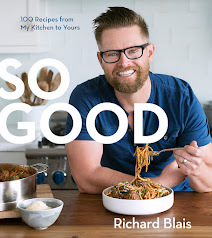 So Good: 100 Recipes from my Kitchen to Yours is out and ready for purchase. My second cookbook takes a look at how I cook at home, a little more casual but still just as creative and delicious! There are also some cool techniques and ingredients for those that want to challenge themselves in a few recipes. Consider ordering your copy today and let's get cooking!